I was browsing around the visual portfolio website, Behance, when I first stumbled on Radha Ramachandran’s beautiful hand illustrated work. 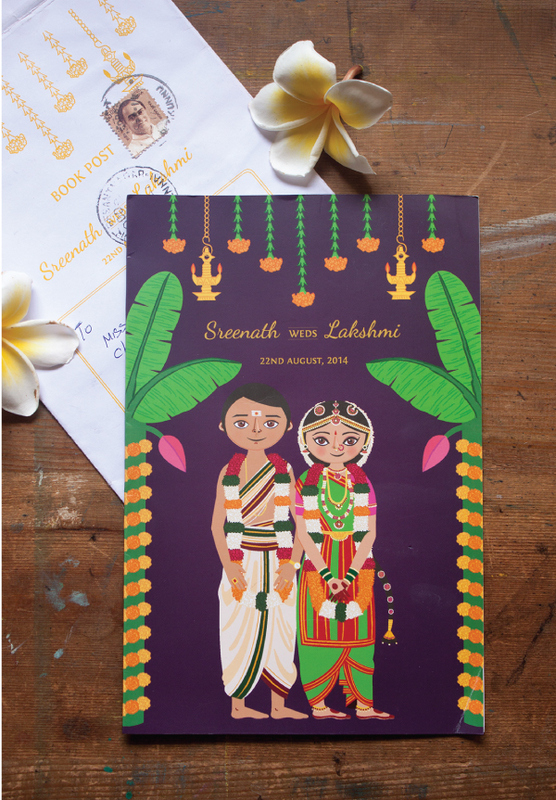 Radha makes beautiful, personal illustrated wedding invites, and they’re each one of a kind. Radha has only taken on three projects so far (after all, she does confess to doing this only on the side), but if you’re lucky, yours might be next 🙂 Read on to know more about Radha, her style of illustration, and her SUPER CUTE invitations! How did you start out designing wedding cards? I added images of the illustration to my Behance portfolio, where they were spotted by a relative of an old school classmate, who then got in touch to ask if I would consider doing something similar for her cousin’s wedding. I dragged my feet over it a bit, ended up saying yes, and had a ball illustrating a traditional Tam-Brahm bride and groom for the card. Since then there have been many inquiries, but not all of them have converted into actual projects for various reasons. I think I’ve done one invite a year since the one I did for my sister in 2013! The last one I worked on, was of a Saraswat bride and a Maharashtrian groom (with a twist of sorts), and the mother of the groom who contacted me after having seen the previous two invites on Pinterest, is hands down one of the sweetest clients I’ve ever worked with. What would you say is your style of design? I see myself as being more of an illustrator than a designer, and at the moment I consider customized wedding invitation projects on a case by case basis. As I mentioned earlier, I’ve only worked on three wedding invitations so far and all three are more or less in the same style…i.e. centered around simple yet detailed illustrations of the bride and groom in traditional wedding attire, and minimalistic traditional wedding decor elements in an illustration style that I’m particularly fond of. It might be fun to explore doing invitations in different styles down the line and I’m always open to custom requests, but I work full-time along with taking on certain freelance commitments, and so for now I’m happy to work on the occasional invitation focusing on illustrations of the bride and groom along with key decor elements in this particular style. A photo of the couple holding their personal invite – Aww! What do you love about creating wedding invites? I think my favourite part about creating wedding invites in this style is the bit where I get to research various traditional wedding rituals, ceremonies and attires. I absolutely love getting to draw pretty brides in full bridal dress, jewellery and flowers! While I can’t promise a 100% resemblance due to the style of illustration, I do try and customize the features to the best of my abilities. I usually request the client to give me as much information as they can regarding the wedding such as what style the rituals are going to be in, what the bride and groom will be wearing, details in the decor etc., so it can be incorporated in the card where possible. (For example, the marigold and leaf decoration on the top of the ‘Ramya weds Ashwin’ card was inspired by the actual decor that the wedding hall decorator planned to do for the wedding, and the attire of the bride and groom in the ‘Sumedha weds Varun’ card was inspired by what they were actually planning to wear on that day.) I really enjoy trying to get the details just right. I’ve been lucky enough to work with ‘kindred-spirit’ clients on my last two invites, and it’s also a high when the client gets back to you after the wedding to tell you that the cards were well-received and liked by family and friends. These cute designs are such show stoppers. Each and everyone must have been so amazed to see the card. very unique, very new ,very fresh. I just loved the idea. May i get the price pwr piece for this wedding card?